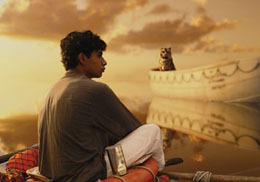 Ang Lee's allegorical "The Life of Pi" (2012) is a film to appreciate slowly and carefully. It is a friendly post-modern, global fantasy, making the "Wizard of Oz" seem like a clunky product from a nation that now only exists in triumphalist superhero fables as it fights mercilessly for its final gasps of air. This is a smart film, the most intelligent meditation on religion in quite some time. Lee's masterful direction fills us with dramatic, wonderful visuals, and the type of relentless unpredictability we starve for as we wade through the usual zombie-like assortment of formulaic blockbuster crime movies. This is the story of precocious Pi Patel. Rather, a mature, middle-aged Pi Patel tells his story to a young man who hopes to find belief in God as part of his search to find his own place in the world. We learn, then, that Pi grows up in post-colonial India under the care of a cold science-loving father and a warm, supportive mother. Already outcast by his peers for an odd name ("Piscine," named after a swimming pool in Paris), he takes on the shortened "Pi," reflecting the math constant, as well as a symbol for the circular nature of life. "Pi" here is fact and metaphor. Soon, he develops an appetite for God, discovering Catholicism to supplement his Hinduism, then adopting Islam to fill in any remaining gaps in time. His father warns him against blind faith, while his mother supports his curiosity, even when he nearly kills himself. It might sound corny, but his curiosity gets him nearly killed by a cat. In any case, these events further propel him onto a quest through disempowering entrails of then-contemporary existentialist Western philosophy. 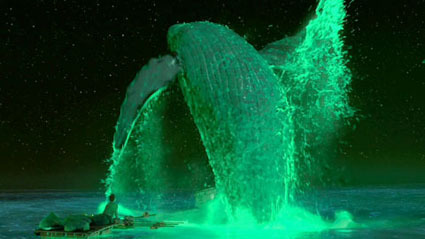 Now, the trailers for the film give the impression that "The Life of Pi" is a castaway film. That sequence, mostly involving a hungry tiger, is the most spectacular and dramatic of the film, but it is the film's second act. Meaning, this film has so much more. The film, overall, is the story of a young man, driven by curiosity to find the ultimate destination - God - and subsequently gets tested on it down to his final remaining fibers, and then tested beyond. Searching from science, to math, to beauty, to rhythm, to philosophy, to the sharp stare of a tiger's eyes, he cannot help himself. Not only does his curiosity open his eyes, it also saves his life, endangers it, and answers his biggest questions. And, what are his biggest questions? How do we connect to God? In our culture, we usually get stuck at the question of God's existence, assuming that even in any possible existence, God is effectively an absence. That question of existence leads some to ask, rather exclaim, "Where is God!" either in addressing our pains or in satisfying our inquiries. Many are the converts to Atheism that I met who felt God's apparent absence in their moments of physical, emotional, or intellectual need. But, Pi is beyond such concerns about God's existence, for they - like the skepticism his father practices - are limitations. Skepticism kills curiosity just as quickly as does dogma. For him, the connection to God at first involves all sorts of connections: connecting with life (as expressed in the film's essentialist Hinduism), experiencing love (Catholicism), and connecting to the earth (Islam). That is, after all, in a most base form "religion," being a system of connecting. But, in the film's second act, he does experience an absence. Rather, he experiences two absences. This is not the absence of God, but the loss of all that he possesses. He gets forced into an ascetic retreat. In Western asceticism, we commonly read about aspirants who live in the forest or the cave. In Eastern asceticism, in contrast, we commonly speak of people who submerge themselves in water, whether we speak of Hindus in the Ganges or the Dao as a river that penetrates all life. In this film, though, the labels of "West" and "East" are less relevant, for this is a world where everything tangles with everything else like the branches and vines of an ancient Banyan tree. But, during the film's shipwreck, Pi makes his way on a boat in the middle of the Pacific Ocean, and eventually finds an ominous twisting forest. The second absence is the answer to another question: "What does God want from me?" He finds purpose in taking care of his fellows in his lifeboat. He finds beauty in the beauty and awe in the awesome majesty of the world around him. In other words, he finds hope through the beauty, for beauty is an expression of hope. And, he finds fear in the awesome power. The two - fear and hope - are inseparable. And, sometimes, he finds both simultaneously. In the middle of a violent squall, he watches lightning dance its way around him. In the middle of a calm swim through a sea of bioluminescent jellyfish, a whale jumps through the air joyously crashing down on all of Pi's food. So, what does God want from him? God apparently wants from him to reach for the stars. Meaning, God apparently wants Pi to reach higher for God than he has before. But, to do so, he must shed every last thread of his existence, for his old self is anchoring him down. It may be, then, that his father's assertion is correct: that when Pi looks into the eyes of the tiger, he sees not a soul but a projection of his own self. 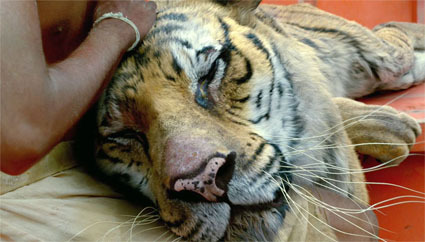 And, if his father is correct, then Pi will finally find rescue when he frees that roaring tiger within him. In the first act, then, he embraced the forms of religion. In the second act, he sheds the forms in the embrace of the essence. The film also does raise a question in its conclusion: which is the accurate story? Without my revealing anything, near the end Pi gets pushed to offer a more palatable version of his tale. 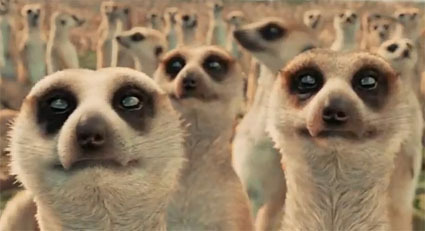 His is a tale of tigers, zebras, hyenas, orangutans, meerkats, and human-shaped, living islands. His alternate tale focuses plainly on the humanity battling each other for survival. According to the film, the answer is that both are accurate, in that a base message of religion is that what happens is both factual and metaphorical. My prostrations to the ground have meaning beyond the act of bending and stretching. And, when God interacts with us, so too is the same true: when God self-discloses or communicates, the events within and around us are factual communication by way of metaphor. In its embrace of religions across the spectrum, this film embodies the sense of the Perennialist Philosophy. While we might commonly, naively state that all religions are more or less the same, the Philosophia Perennis argues something similar, though more sophisticated. In this theory, some religions are authentic, and every such authentic, traditional religion originates from God, and thus, at an inward or esoteric level, there is a transcendent unity of religions. But, every such religion, with its own tradition, produces its own full universe of external forms. Meaning, in this outlook, the main religions mentioned - Hinduism, Catholicism, Islam, Judaism, and Buddhism - on the inside all come from God, and on the outside manifest their paths in their own ways. From the Perennialist perspective, then, the "dark side" is science and protestant fundamentalism. Both approach the world by way of rebellion against a natural order of things. Science, in this paradigm, is a skeptical atheist method that seeks to discredit, while protestant fundamentalism (in every religion, not just Christianity) masks as belief while seeking to discard tradition. We can expect, then, that critics of the Perennialist Philosophy regard it as anti-modern and loose with facts. But my goal here is not to discuss philosophy, but to ask a question that this film has me thinking about: is religion, truly, newly relevant? Earlier, I called this film post-modern, and my emphasis was both on its embrace of religion, as well as its ignoring of the modern dichotomy of looking at the world as "The West and the Rest," ignoring it so much that North America is very much part of the story, though the US is conspicuously not. Regardless, a modern critique of religion is that it is factually incorrect, and mostly irrelevant, especially against Science. A post-modern critique of Science, however, is that it is not a source of values, save for the value of survival. This film embraces religion more than any major mainstream in recent memory; if it succeeds at the box office, I wonder if that is an indication of a new rise of religion, or at least a yearning of some sort. Of course, the film is strong enough as entertainment that my question might be irrelevant. Thus, much of the joy of this film is that it maintains its overarching philosophy without skimping on narrative or spectacle. Religiously themed films tend to force their narratives to submit to their philosophies, which is something we have been seeing in latter Shyamalan movies. Here, however, every scene is beautiful or captivating. David Magee's script based on Yann Martel's book draws on every emotion, and as writer of "Finding Neverland," this mix of reality and fantasy is a perfect fit. The combination of Claudio Miranda's cinematography and Tim Squyres' editing is breathtaking; such a colorful movie, though the blue-orange mix will stay in your mind. The cast, especially the various Pi Patels (Irrfan Khan, Suraj Sharma, Ayush Tandon, and Gautam Belur) makes us forget we are watching actors. And, Ang Lee is a master of modifying film genres, by inverting the outward forms, while maintaining the genre's essence. Having conquered the spy film, the martial arts film, the western, and the comic book film among others, here, he makes "The Life of Pi" a fantasy film blaspheming the tradition by talking about religion and God. In addition, in this film he brings us a Bollywood film with minimal dancing, no songs, and Tamil dialogue (rather than Hindi). And, he succeeds in his delicious heresies on all fronts, yet again.